Why Do We Baptize on All Saints’ Day? There are four days throughout the Church year that are set apart as being especially appropriate for Baptisms. Those days are the Baptism of Our Lord Jesus Christ (which is the first Sunday after the Epiphany), Easter, Pentecost, and All Saints’ Day. Now three of these days appear to have fairly reasonable connections to baptisms, but one is not so readily apparent. It makes perfect sense to baptize someone on the very day on which the Church commemorates Our Lord’s baptism in the River Jordan. Since Easter is the day on which we celebrate Christ’s victory over death, it makes perfect sense that we would baptize new believers into the new life which triumphs over death on that day. Since Pentecost is the day on which the Holy Spirit fell upon the Apostles in the Upper Room, it makes perfect sense to recall that, on His baptism, the Holy Spirit descended upon Our Lord like a dove. And then there is All Saints’ Day. 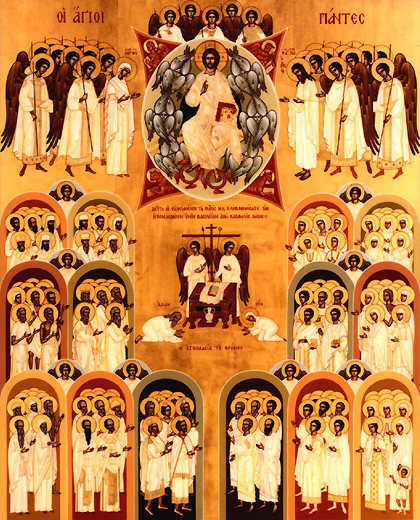 All Saints’ Day, or Agion Panton in the Eastern Orthodox tradition, is a Solemnity of the Church year on which we honor all of the saints, known and unknown, who worshiped the Lord Jesus Christ throughout the two thousand years of history of the Church. In the East, the Christians first celebrated the feast in 893 when the Emperor Leo VI dedicated a church to “All Saints” after the Patriarch refused to allow the emperor to dedicate the church to his deceased wife. Orthodox Christians celebrate their All Saints’ on the first Sunday after Pentecost. In the West, the Feast dates back to the early seventh century when Pope Boniface IV consecrated a chapel in St. Peter’s to all of the saints. In the middle of the eighth century, Pope Gregory III transferred the observance of the Feast of November 1. All that being said, why baptize new converts on All Saints’ Day? What is the connection? Why are baptisms so integral to All Saints’ Day that, even when there is no one to be baptized, the church members reaffirm their own baptismal vows in solidarity with those new converts around the world who are being baptized that day? As circumcision was to the Jew, Baptism is for the Christian. As a result, Baptism is not just a sign of repentance, a moment of sanctification, and cleansing of sin, and impartation of special Divine Grace, but it is also an entry into a covenant community. For the eight day old Jewish boy, nobody asked if he wanted to be a Jew. His parents said, in effect, this is who we are; this is who our child will be, and they circumcised the child. When God told Abraham to begin circumcising all males, The LORD said it was so that God would “establish My covenant between Me and you and your descendants after you in their generations, for an everlasting covenant, to be God to you and your descendants after you.” (Genesis 17:7) Circumcision was not some flesh-mutilating ritual to scar their children; it was a permanent sign in the flesh of all males that they were a part of a covenant community. It was never “Jehovah and Me” for the faithful Jew. It was always about their relationship with God and their role as one of the innumerable Children of Abraham. We err when we believe that we can live the Christian life on our own. Christians were always called to live in community, from the apostolic days onward. In the Epistle to the Hebrew, we are warned, “not forsaking the assembling of ourselves together, as is the manner of some, but exhorting one another.” (10:25) As it is the New Covenant equivalent of circumcision, Baptism is likewise entry into a covenant community. In our baptismal liturgy, once the candidate for Baptism has announced their intention to be baptized and responded to the inquiry of the celebrant, the priest asks the congregation, “Will you who witness these vows do all in your power to support these persons in their life in Christ?” The congregation responds “we will” and, in doing so, enters into the covenant with those receiving the Sacrament of Baptism. For the newly baptized, their relationship ought never to be just “Jesus and Me” but their walk with the Lord ought to include an intimate and personal relationship with Jesus Christ as well as a committed relationship to an active Christian community in the form of their local church. A Christian is not baptized alone, nor should he or she ever expect to live out the Christian life on their own. Why do we baptize on All Saints’ Day? Because, on All Saints’ Day, we acknowledge all of the members of the covenant community, known and unknown to us, into which we are being welcomed. The newly baptized is not just entering a covenant community with the members of his or her local parish. Likewise they are not just entering a covenant community with the members of his or her own denomination. They are not entering into a covenant community with all Christians worshiping God today. Rather, the newly baptized Christian enters a covenant community with all faithful believers who have ever lived and worshiped Jesus Christ. The community is not just the faithful we see, but also those who stand before the throne and worship Our Lord face to face. 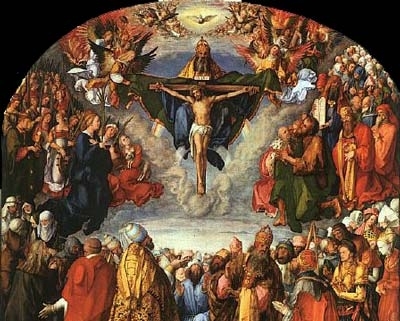 We are one community, “one body” as St. Paul tells us, not only with those alive today, but with the saints, confessors and martyrs, whose names are known to the Lord alone. We baptize on All Saints’ Day because when the newly baptized rises from the water he or she finds himself not only in a permanent relationship with Jesus Christ, but also in a covenantal relationship with All Saints who have ever lived and worshiped Jesus Christ. As we join their glorious company, it makes perfect sense to baptize on the day we honor their faithful commitment to Our Lord. O Almighty God, who have knit together your elect in one communion and fellowship, in the mystical body of your Son Christ our Lord: Give us grace so to follow your blessed saints in all virtuous and godly living, that we may come to those indescribable joys which you have prepared for those who truly love you: through Jesus Christ our Lord, who lives and reigns with you and the Holy Spirit, one God, in glory everlasting. Amen.